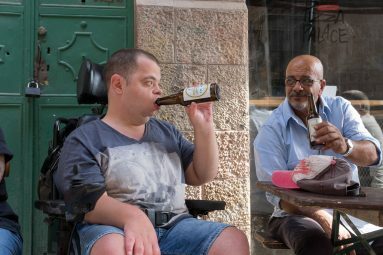 Tsad Kadima’s homebrewed beer workshop is a unique program for participants of the Adults Day Center, which allows people with disabilities active participation throughout the different stages, both theoretical and practical – from the first stage of planning, to production and possibly even marketing. The program allows new experiences as well as preparation for employment. A most appropriate creative motivation for young adults, even in cooler climes – older ones too. It seems to be a very nice and indeed a unique CE program. I am always very pleased to hear that adult CE is alive...Well done Tsad Kadima. In the meantime Andrew, I would like to draw your attention to a similar adult CE workshop (producing paper items) running throughout the whole calendar year in Unterschleißheim, Germany. 12 adult people imployed in this CE workshop.